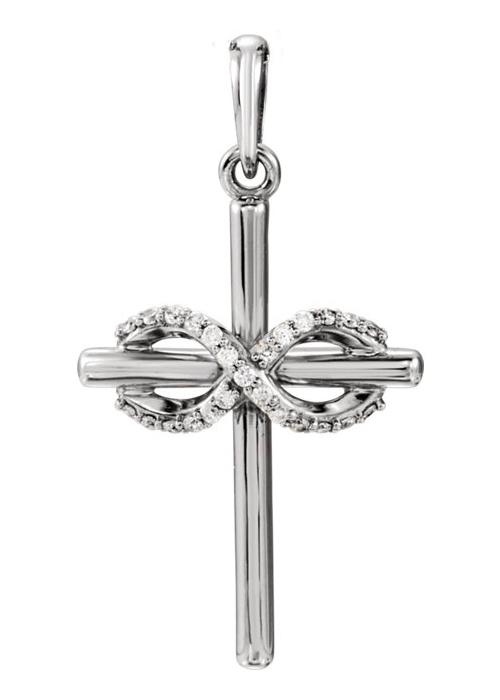 This women's diamond infinity cross necklace in 14K white gold from Apples of Gold Jewelry will allow you to express yourself with everlasting, infinite love and faith each time you wear this pendant. The cross, which is highly polished white gold and slightly tubular, is an interesting design. Wrapped around the arms of the cross is an infinity symbol with small diamonds, totaling 0.06 carats. The diamonds, which are rated G-H for color and I1 for clarity, bring about so much sparkle and dazzle when worn. The pendant is just under 1 inch tall and 0.57 of an inch wide. "For he shall give his angels charge over thee, to keep thee in all thy ways. "(Psalms 91:11). We guarantee our Diamond Infinity Cross Necklace in 14K White Gold to be high quality, authentic jewelry, as described above.